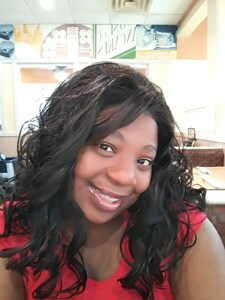 Kennethia “Tekie” Deona Brown Dozier, 34, of Columbus, GA, formerly of Junction City, KS, departed this life on January 12, 2019. She was born on February 14, 1984, in Junction City, Kansas. As a young girl, she attended the Apostolic Academy of Junction City and was once a member of Faith Tabernacle Church. After her formal schooling, she had the opportunity to do one of her loves which was traveling. Tekie got to go to many states with a company she was employed with. Afterwards, she came home to Junction City for a short time, but her restless nature took her to Kansas City, Missouri. She lived there a few years until she met Ray Dozier. He was a resident of Columbus, Georgia, and she decided to make her life with him there. She made her home in Columbus until her passing. Tekie was outgoing, friendly, kind hearted, and very forgiving. Her heart was tremendous. She was one of the most loving persons you could ever know. Every night she would call her mother, Debra, like clockwork at 11:30pm and say “Hi, Honey Bunches of Oats”. She was a dreamer and had a love of traveling and adventure. Tekie was the life of the party and she didn't know a stranger. Above all, she was a devoted mother to her baby Reona, loving sister to her siblings, and will be dearly missed. Tekie has to carry on her memory: her daughter, Reona Brown; parents Debra and Lee Pugh, Junction City, KS; biological father, Ollie Brown, Sr. of Junction City, KS; brother, Ollie Jr. and wife Erica Brown of Junction City, KS; two sisters, Jeona Pugh of Junction City, KS, and LaToya D. Brown of Kansas City, MO; and a host of loving family and friends. She was preceded in death by her brother Shonn M. Givhan Brown and brother-in-law Donell "Tiny" Manning. Visitation will be held Friday, January 25, 2019, from 6:00 pm. to 8:00 pm. at the Johnson Funeral Home of Junction City, 203 N. Washington St.
A Funeral Ceremony will be held on Saturday, January 26, 2019, 11:00 am at the Faith Tabernacle Church of Junction City, 1010 Burke Dr., with Pastor Nathan Dudley officiating. Burial will follow at the Highland Cemetery of Junction City. Memorials are suggested to the “The Reona Brown Fund” in care of Johnson Funeral Home. Please also sign me up for Johnson's email newsletter. Add your memories to the guest book of Kennethia Dozier. I've just learned of the lost of dear Tekie. Please know that I'll be praying for you all to experience comfort during this time of sorrow. I have so many precious memories of her that I will cherish. May GOD'S loving arms surround and comfort you all. My heart is sad over Tekie's passing, but oh the funny memories that will forever live on in my mind. Tekie girl, you was such a talker. I remember telling you if you didn't stop talking so much I was going to have you put your tongue on the flag pole , then we both fell out laughing. Thank you Deb for allowing me to be a part of her life, and know that my prayers are with you. With many fond memories of Tekie, I most loved her sense of humor. More specifically, my favorite memory is from youth camp of '99, her punch line to lighthearted banter was busting out singing "The Question is..." (Winans) referencing a jar of dill pickles. It was hilarious and none of us could top that. Her kind, warmhearted, and gentle soul will be missed. Exceptional service, patience and understanding was shown from each and every staff member we had contact with. We were treated kindly from the moment of first contact.